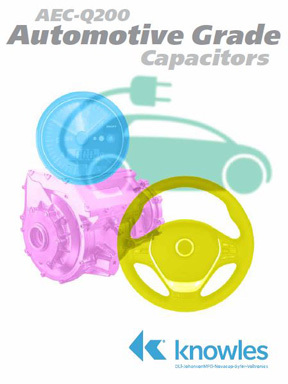 One of Knowles Capacitors fields of expertise is the design and manufacture of components important to engineers in the automotive industry. Today’s vehicles have many electric power units and electric control units that enable electric drive and absolute precise control. 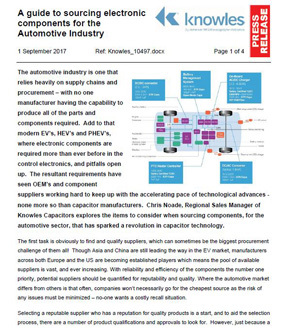 Knowles has developed a range of MLC capacitors and surface mount EMI filters qualified to AEC-Q200 rev D to meet the needs of high reliability and automotive manufacturers, and Knowles currently supplies the AEC-Q200 products in the lead-time of 7 weeks. Please refer to the following brochure pages for details of the product ranges offered by Knowles Capacitors. Knowles Capacitors (Syfer Technology Limited) has been manufacturing multilayer ceramic capacitors for over 35 years. This wealth of experience in designing and manufacturing MLCCs has enabled them to develop a wide range of multilayer ceramic products. Syfer’s comprehensive product range includes many application-specific capacitors, as well as standard voltages and capacitance values. All Syfer Technology Limited products are available in small, medium and large volumes. Component Distributors, Inc. (CDI) is a value-added distributor of high performance LED, power, rf & microwave, wireless and sensor component technologies. CDI distributes globally and provides local application support and customer service across the Americas. CDI delivers cutting edge power electronics by wrapping application support, development tools and design services around high-performance products from industry leading manufacturers.